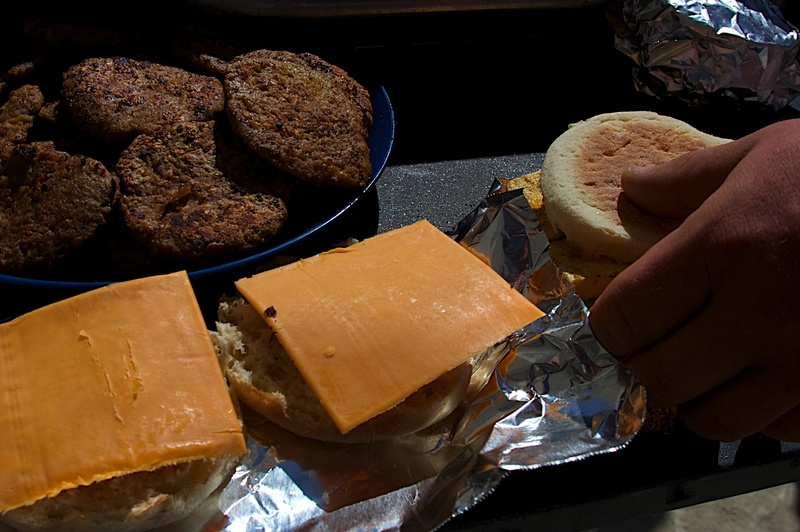 These were the main feature of our Vegan Deliciousness that I (with the help of some of my great campmates) served to 200 people on Tuesday morning at Burning Man in 2009. It was definitely one of the high notes of our camp as far as events went. If you want to check out the video, you can see it on the YouTubes. I’ll give you the recipe to make just one, and you can adjust to suit however many people you want to serve. Oh, and ALLERGY WARNING: these are totally not gluten free in any way. I cheat when I’m on vacation. Slice your tofu about half an inch thick. You’ll need 2 per muggin. Fry the tofu in a pan using Earth Balance, sprinkling with a little turmeric to add color and some Spike, salt, and pepper for flavor. The tofu will be done when it’s hot and most of the moisture has been cooked out. It will be a little browned on the outside, and that’s just fine. Note: After you flip the tofu for the last time and are waiting for the side that is face down on the pan to be done, add a slice of the cheese to the top so it has time to melt. The tofu is done when the cheese is melty. You can help the cheese melt by putting a lid over the pan. Also make a patty the size of the English muffin and around 1/4 inch thick, and fry that up at the same time as the tofu. The Gimme Lean is precooked, so you just need to make this hot and browned on both sides. In the meantime, toast an English muffin and butter it. When the tofu and sausage are done, it’s time to serve, so make it into a sammich and eat eat eat! Personally, I like to have this with a little Cholula (use whatever hot sauce is your favorite). When I served these at Burning Man I wrapped them in foil to keep them warm and that worked out just fine. For extra awesome, enjoy with mimosas.